after completing the first 10 squares of this quilt I was very nervous (again). I wasn't sure it was going to look right. I contemplated scratching it and starting completely over, but my husband (and voice of reason) told me it was just because I don't work with purples very often. I kept at it, afterall, I don't often redo things, and I am glad I did. These plums and pinks and golds are so pretty! The design is simple, but striking. I have become pretty attached to this quilt. 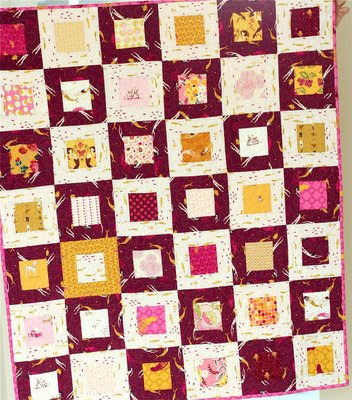 The backing is mostly yellow, but I pieced one side...I always love a pieced back. I used to do fabulous pieced backs, it was my thing...lately I have been lazy and haven't been piecing. 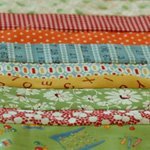 I need to un-lazy myself, because I really love the surprise a pieced back gives a quilt. purple is so not a color i like, but you have really made it work. i love this combination. it's stunning again! It is so beautiful!!! The color choices are so nice and all work together perfectly I love love love the one square of yellow! 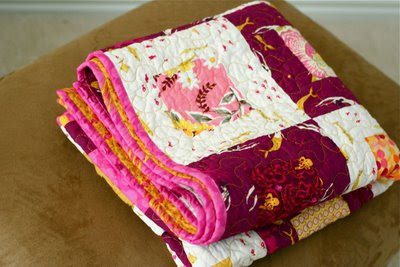 It's a very pretty quilt! it's fabulous!!! I LOVE the pieced back. so much. Very pretty and the colors work great together! I love pieced backs. I used to do them all the time and lately...yes perhaps lazy! 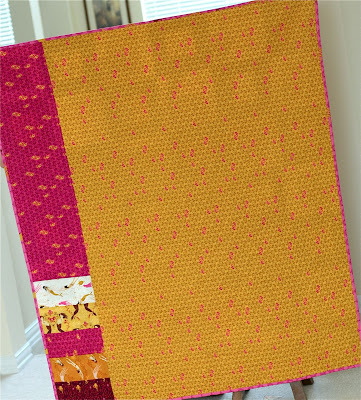 Very eye catching color combination and I love the squares. 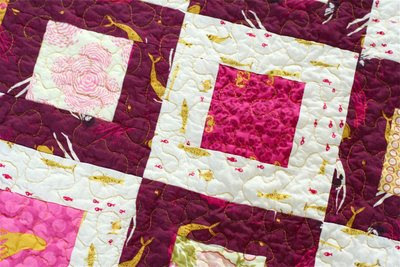 Love the contrast on this quilt, and the colors are great together. Isn't it nice when you're happy with the end product...especially when you start feeling nervous about it! Great job. I love the way this quilt came out. I've wondered what to do with that Heather Ross fabric - and this is fantastic. It's so pretty! Great job! I love how the colours pop!